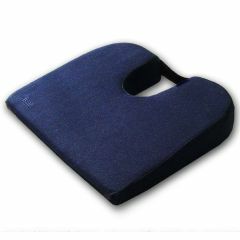 The Visco Memory Foam Coccyx Cushion is made of high quality standard density memory foam (3.5lb) and helps relieve back pain by reducing the pressure on the spine and coccyx. The temperature-sensitive coccyx pillow foam interacts with body heat to gently mold to your shape and provides customized comfort. The cut-out section eliminates painful pressure on the tailbone. Sloping wedge shape helps correctly align spine and tilts the pelvis forward to restore the natural lumbar curve, a position often recommended by doctors to provide maximum comfort and relief. Can be used with almost any seat: Car seat, Office chair, Home.....virtually anywhere. Coccyx (tailbone) bone pain can come from local trauma or childbirth. A fall on the tailbone can stress the ligaments or injure the attachment to the sacrum. In a significant percentage of tailbone pain the cause is unknown (always check with your doctor for diagnosis and proper care). Individuals with tailbone or coccyx pain (Coccydynia) often find sitting is the most aggravating position. Many tailbone pain sufferers find the most comfortable cushion is the type with a cut-out at the back, underneath the coccyx so that no direct pressure is placed on the coccyx. Visco-elastic memory foam was originally developed by NASA and used on space shuttles to relieve pressure on astronauts caused by G-Forces during take off. It is several times denser than regular polyurethane foams, is temperature sensitive and always recovers to original shape. It is also called slow-recovery foam (see picture). Due to its distinctive property in relieving pressure, memory foam has been developed into many products such as pillows, toppers, wedges, supports, etc., to benefit millions of consumers worldwide. What benefits does memory foam offer? Memory foam has higher density and thus is more supportive and conforms to your body more. Memory foam is temperature sensitive. In normal temperature, it is firm, but when you use it, it reacts to your body temperature and molds to your shape. This way, it minimizes the pressure points, distributes the weight more evenly and provides customized support. High quality memory foam often has open cell structure that breathes better and helps distributes the weight evenly. Are all memory foams the same? No. There are huge differences in quality. One of the key differences is density. Usually, the denser the foam, the more supportive it is and the more it conforms to your body. High density foam (e.g., 6lb/ft3 ) is usually made with molding process while low density (e.g., 3.5lb/ft3) foaming-and-cutting process. Durability is another important quality aspect. Due to manufacturing differences, some foams lose their “slow recovery property" over a short period of time while high quality foamsnever lose their resiliency. Cell structure is also important. High density, high quality foams usually have much smaller cells and thus many more cells per unit volume. This helps the foam breathe better and thus distributes weight more evenly. How do I know which memory foam product is high quality? Hold It: High density memory foam product is heavier than other products of the same size. Press It: If you use your hand to pressure the foam, it should recover to its original shape slowly. If the foam recovers too quickly, then the quality is probably lower. Look at It: High quality foam usually have smaller and denser cell structure. If you see big cells, then the foam’s quality is probably lower. Use It: If the foam loses it’s supportive property and feels like a regular foam after being used for a short period of time, then its quality is low. High quality foam maintains its resiliency even after a long period of time. Office. Home. Everyday. Men. Women. Daily Use. Short Term User. Long Term User. OLDER AND IN PAIN. I have 2 hip replacements &amp; a ruptured lumbar disc. this cushion allows me to drive &amp; sit in normal chairs with greatly reduced pain. I haven't tried many other products like these but this is a lifesaver for me. Office. Home. Women. Everyday. Limited Space. new user. OLDER AND IN PAIN. Work at a desk many hours. The cutout in the rear of the cushion relieves the pressure on my tailbone and lower back. Comfortable. Solid Construction. Easy To Use. seating easier. Everyday. Women. pad for scooter. Long Term User. Elderly. none. I ride a scooter and the seat was very uncomfortable and this pad makes it much better. Comfortable. Solid Construction. Easy To Use. Effective. Good Smell. Good Value. Home. Everyday. Daily Use. Men. new user. OLDER AND IN PAIN. very satisfied, obese with degeneritive disc disease and this works nice in my easy chair and especially when traveling. Comfortable. Solid Construction. Attractive Design. Short Term User. broken tailbone. Value Oriented. I had a kayaking accident while going over a rapid &amp; my tailbone was broken. Went to several stores looking for a cushion without success. This cushion is exactly what I needed &amp; it's comfortable &amp; allows me to sit without hurting my tailbone. The cover is nice too. Very comfortable, and material is a knit, you will not slip, it is a firm foam, well made. Answered on Jun 4, 2014 3:51:47 PM by Marti from N.E Pa. The cushion is thick and firm and not slippery! I'm pleased with it and the carrying handle is a bonus. I WEIGH 350 AND NEED A CUSHION FOR MY WHEELE CHAIR IT MUST BE 1 1/2 TALL. Asked on Jan 17, 2013 12:00:27 PM by RANDY from WA. This cushion is better than some of the others. The back is 2 1/2 " sloping to 1 1/2 " in front, and very firm, but soft and comfortable. Answered on Jun 4, 2014 3:55:57 PM by Marti from N, E, Pa.
my weight is 132 lbs, height 5.5 and aged 27 years; what sort of cushion will be suitable for my coccyx pain? order the extra firm if you have chronic back pain and need to sit for prolonged periods of time..it is the ticket ! I also suffer with coccyx pain and a firm cushion with the coccyx cutout in the back of the 2-1/2 inch thick cushion works well to relieve coccyx pain. I WEUGH 210. THE CUSHION DOES COMPRESS, BUT NOT MORE THAN 20/25% OF THE ORIGINAL.SIZE. I HAVE WASHED THE CUSHION COVER WITH GOOD RESULTS. LOVE THE CUSHION AND LOOKING FORWARD PURCHASING ANOTHER...GREAT PRODUCT!!! I weigh 220 and had a vertebra removed 20 yrs ago with ongoing pain. I got the extra firm cushion and use it on my recumbent bike. It holds up exceedingly well and provides comfort during my hour ride every other day. Do you ship overseas, specifically Australia and, if so, what would be the cost of shipping? How to decide which of (soft, extra soft , firm or extra firm) cushion will be best for me? Generally depends on the size and weight of the person using it. For a small person soft and for a heavier person the firm is probably going to work. Ordered this for my mom who suffers from sciatica.. When placing order by phone discussed her age (94) and weight (100#) and went with the recommended extra soft. It was great for her. So much so we purchased a second one.